Late last month, a Democratic National Committee “victory task force” released its preliminary report on what the party needs to do to avoid a repeat of the pasting it received in November’s midterms. One of its main recommendations: The party needs to take control of more state legislatures in time for the redistricting that will follow the 2020 census. Though they tend not to get much attention from Beltway insiders, state legislatures are key players in redrawing congressional-district boundaries. In most states, it’s the state legislature that takes the lead role in drawing new district maps, according to the National Conference of State Legislatures. (Commissions do this job in 13 states and have advisory or backup roles in seven others, although the Supreme Court is currently weighing the legality of the commissions’ task.) Given the inherently political nature of redistricting, which party controls the legislature can be crucial to a state’s final maps and thus, control of Congress. Democrats have “suffered devastating losses at all levels of government” over the past several election cycles, the DNC report noted. 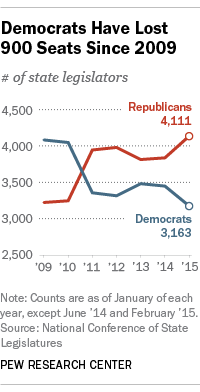 According to our analysis of NCSL data, the Democratic Party today has 919 fewer legislative seats than it did in 2009. 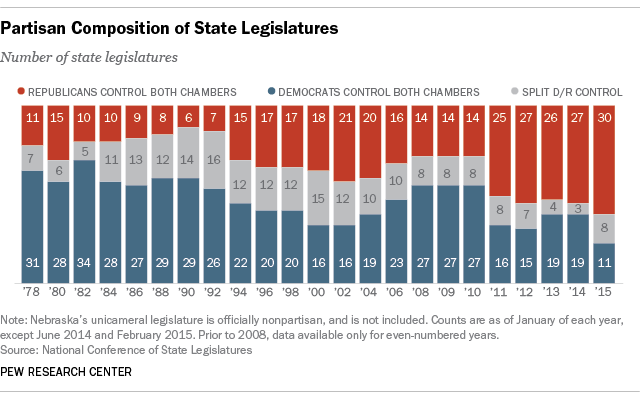 Democrats control both legislative chambers in just 11 states, down from 34 states in 1982 and 27 as recently as 2010, though that number had fluctuated in the years in between. Meanwhile, Republicans have gained a total of 888 legislative seats since 2009, and control both chambers in a record-high 30 states. In eight other states, each party controls one chamber.